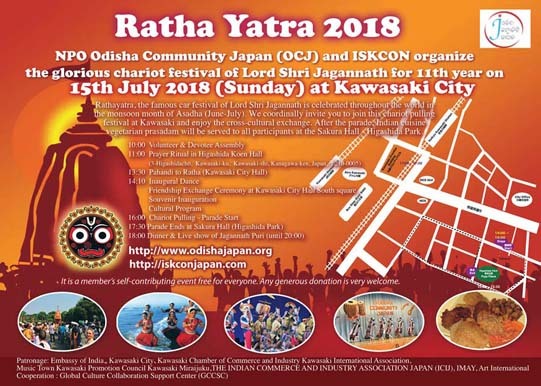 The Odisha Community Japan (OCJ) together with their sponsors and patrons will celebrate the 2018 Rath Yatra at KAWASAKI on 15th July. This will be the 11th consecutive year of our celebration in Japan. During the event a 3-meter tall chariot will be pulled by participants on a road near Kawasaki station. In addition to the chariot pulling spectacular dance and plays will be performed during the parade. Prasad and dinner will be distributed after the chariot pulling. Please join us in this celebration that has common heritage between India and Japan. Prasadam and bhajan: @ Sakura Community Hall.